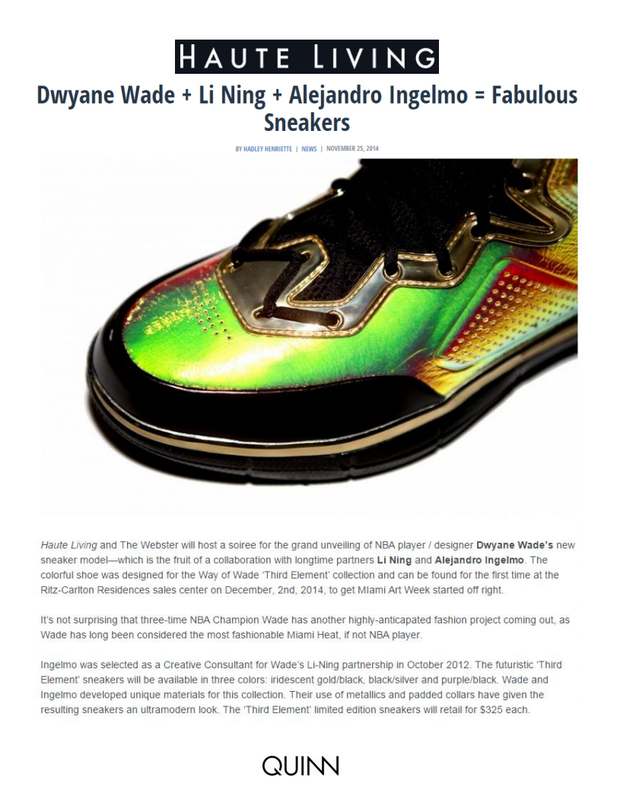 Haute Living and The Webster will host a soiree for the grand unveiling of NBA player/designer Dwyane Wade’s new sneaker model- which is the fruit of a collaboration with longtime partners Li Ning and Alejandro Ingelmo. The colorful shoe was designed for the Way of Wade ‘Third Element’ collection and can be found for the first time at The Ritz-Carlton Residences sales center on December, 2nd, 2014, to get Miami Art Week started off. It’s not surprising that three-time NBA Champion Wade has another highly-anticipated fashion project coming out, as Wade has long been considered the most fashionable Miami Heat, if not NBA player. Ingelmo was selected as a Creative Consultant for Wade’s Li-Ning partnership in October 2012. The Futuristic ‘Third Element’ sneakers will be available in three colors: iridescent gold/black, black/silver and purple/black. Wade and Ingelmo developed unique materials for this collection. Their use of metallics and padded collars have given the resulting sneakers an ultramodern look. The ‘Third Element’ limited edition sneakers will retail for $325 each.